It is ironic that Resurrection Man should come to a close on a month when so many other new titles are beginning or looking back to their beginnings. It's funny because this comic itself was largely a look back to a classic comic ignored by the mainstream. Also, its' entire plot centered upon one man trying to figure out who he was and start a new life. It spoils little at this point to reveal the big surprise from last issue - that the man we know as Mitch Shelley is a clone, accidentally regenerated out of the original Mitch Shelley. The real Mitch proves to be very much alive, very evil and very pissed off that there's another him walking around trying to help people with the power he was trying to steal for himself. One wonders while reading this issue just how much longer Andy Lanning and Dan Abnett would have kept the central mystery going had they been given a chance. Suffice it to say that while the book does resolve most of it's on-going plots (particularly the battle between Heaven and Hell over the clone Mitch's soul) , it leaves the door wide open for Mitch to appear in other books. 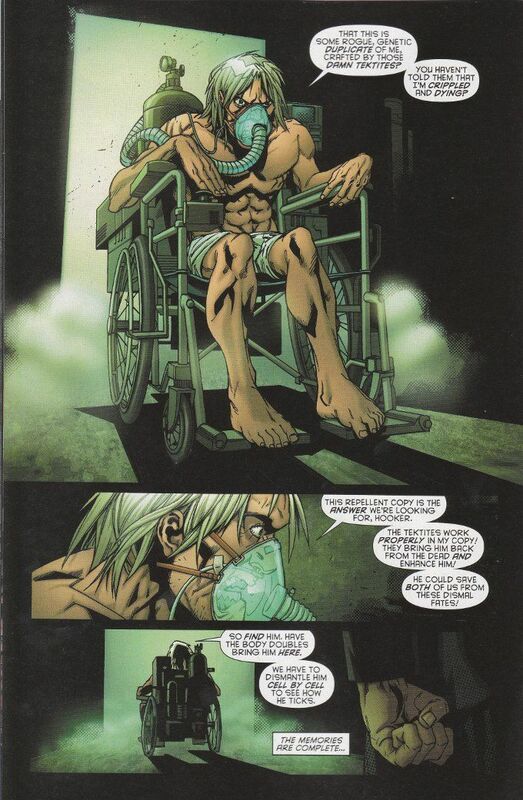 Indeed, the final page seems more appropriate to a comic book's opening arc than it does a final issue and the entire effect of the 13-issue arc is to bring both Mitch and his frequent rivals The Body Doubles back to a state not completely dissimilar to where they were in the old DC Universe. The artwork by Ramon Bachs and Jesus Saiz serves but is not spectacular. The artists' styles prove to be complementary, for what little that matters when Saiz only drew the last page of the book. Hopefully the two of them will find a regular gig elsewhere on another book. Will Mitch Shelley rise again elsewhere in The New 52? He'd be a natural fit for Justice League Dark. And his particular brand of weird-science would not be out of place in Agent of S.H.A.D.E. Wherever he shows up, Mitch Shelley and this book shall always live on in my memories.